Hey, there were still tickets available for Ice Cream Showdown III (SUN 9/11) at Community Boating when I checked. Even with the advance ticket fee, it's still worth a total of $9.75 to stuff your face with delicious ice cream. It's like the Scooper Bowl but smaller in scale and better/smaller companies participating. "New York Says Thank You"
In this documentary, we see several people who were inspired the events of 9/11 to help others who have been affected by various disasters. There will be a free lecture every Wednesday in September on historic architecture in a series called "Hidden Gems: Historic Georgian Houses in the Boston Area". Tonight's program will touch on buildings like the Old State House, Faneuil Hall, Old North Church, and the Pierce-Hichborn House (that's next to the Paul Revere House in North End) as well as buildings that are no longer standing. The founder of "Partners in Health has written a book on his (and PIH's) response to last year's devastating earthquake and the pre-existing factors that contributed to the catastrophe. Performers from Boston and beyond gather together to make you laugh without knowing what they're going to say. Sure, they practice... What would be the fun of an improv festival if they had pre-written material? There's no one can guarantee that an improv show is going to be hilarious, but many of these performers work hard at being prepared. Most performances will be at ImprovBoston with some Friday & Saturday shows at the YMCA Theater down Mass Ave.
Jim Fitting and David Champagne, along with the great Mark Sandman, had a rocking outfit about 20 years ago called Treat Her Right. After playing together at a Sandman tribute concert a couple years ago, they played a bunch of Sundays at Toad with a couple new members. Now it's an off-and-on bluesy rock thing. Undoubtedly, there will be bluesy goodness with Tim Gearan later. 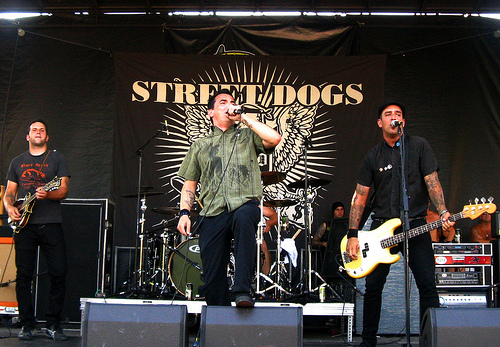 Before hitting the road with the Dropkick Muphys' Shamrock-N-Roll Festival, Street Dogs will do an acoustic gig at Ken Casey's bar. Not only are these guys an excellent example of Boston punk, singer Mike McColgan was the original singer for the Dropkicks. I really like this band, especially since I did a review/interview with them a few years ago.